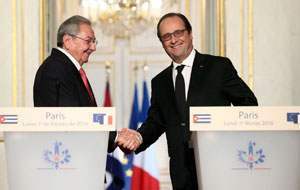 Feb 1 (Prensa Latina) President Francois Hollande (France) and Raul Castro (Cuba) reaffirmed today the willingness to strengthen the bilateral relations. “Today we are opening a new page in the links between the two countries,” said Hollande during a joint statement from the Elysee Palace. He referred to the signing of a bilateral economic road map covering sectors like tourism and transport, while noting that France is among Cuba’s main trade partners. He added that all this was possible thanks to an agreement reached on December 12 between Cuba and the Paris Club on the treatment to the Cuban debt. “We want to go further bilaterally, boosting great cultural cooperation, university exchanges. The French Development Agency is working on the identification of projects that could be boosted, he said. Hollande made emphasis on the existence of a very significant cooperation in the sector of medicine. It is a country that trains many doctors who collaborate with other countries, he added. Meanwhile, Raul Castro highlighted that the two countries are linked by longstanding culturas links and deep bonds of friendship. This is the first visit of a Cuban president to France and to a member country of the European Union. It reaffirms the excellent state of relations and reflects the shared willingness to consolidate the political dialogue at the highest level, he noted. “We have held fruitful talks about different issues of the bilateral agenda. We ratify the willingness to broaden and diversify the relations and cooperation in the political, economic-commercial, financial, academnic and cultural fields, said Raul Castro. He added that the bilateral economic agenda represents an important joint mechanism for the generation, monitoring and promotion of economic-commercial links of cooperation and investment, even in the mid and long terms. “We also appreciate France’s leadership in promoting the construction of a new phase in the relations between the European Union ans Cuba, base don respect and reciprocity,” stressed the Cuban president.